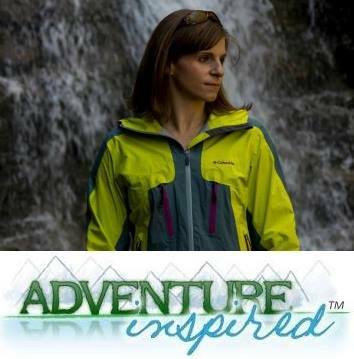 Alli Rainey is a professional rock climber, freelance writer, Harvard graduate (with a major in Modern European History), climbing coach and all-around inspiring human being. Aside from her literary prowess (she's written a "few books"), she's got an impressive climbing resume - three 5.14a redpoints, 50 5.13 redpoints and onsights of more than 200 5.12s. Alli agreed to an interview after we connected on twitter, and I'm psyched to share what she had to say! How did you and climbing meet? I had a boyfriend my senior year of high school who was really into rock climbing. He tried to get me to try it for a few months, so when I had to cut my nails for softball season, I finally agreed. My first day, I made it about three feet off the ground since all of the routes at the Arches (an outdoor bridge made of giant granite blocks) were way too hard for me. I was instantly hooked; all I wanted to do was solve the puzzle. It took me about three months of trying the same route to get to the top without falling! What tipped the scale in favor of a life based around climbing? I lasted a year in the real world after graduating from Harvard. kept hoping I'd find a job/occupation that instilled even an iota in me of the passion I felt and continue to feel for living when I'm climbing, but nothing ever lit my internal fire in the same way. I didn't want to spend my whole life wondering what if I'd chosen to make climbing a priority, and I figured (and still figure) that if and when I'm tired of climbing, I can always pursue something else. What’s your favorite climbing discipline and why? 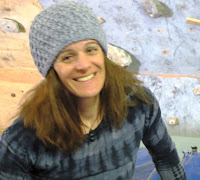 I love sport climbing more than any other climbing discipline because I love climbing solely for the movement (not exposure or danger--I'm a chicken), and the harder the moves are for me and the more of them I have to do in a row, the more I enjoy the experience. I like the challenge of moderating the pump and pacing myself that comes on longer sport routes, the mental challenge of holding it all together until I get to the anchors. I do like bouldering, and I boulder every winter for a break from sport climbing, but every time I tie in and start sport climbing again, I forget about bouldering until the next winter. 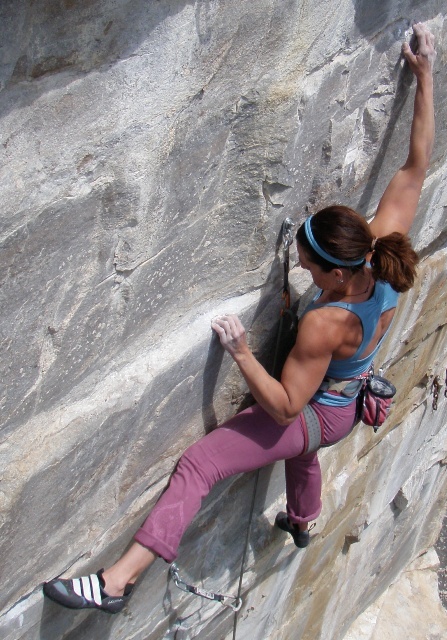 With your incredible climbing resume, a girl's gotta know - what's your secret? No secret. I'm stubborn and I never quit if I really want to send something. It doesn't matter how long it takes me or how much of a beat-down I get. When I'm attempting to onsight something, the higher I get, the harder I try and the more willing I am to lay it on the line. When I'm redpointing, I will studiously revisit places I'm struggling with and adjust my beta over and over again, adding specific training to my regimen to work particular weaknesses if necessary. Whatever it takes. What's the hardest climb you've done? I think I'd say in terms of mental struggle and fortitude, the Hellion (13c) in Ten Sleep (another FFA; I have a lot of those here). I could one-hang it anywhere, but I couldn't put the thing together. It opened my eyes to how far I had to go to train my weaknesses. I had to rest three days after every one climbing day. I didn't give up, and I finally sent it on my last day of climbing here for the season. It was raining and cold and my hands were totally numb, but I fought through and clipped the anchors on my third attempt that day...after that, I started training for real. 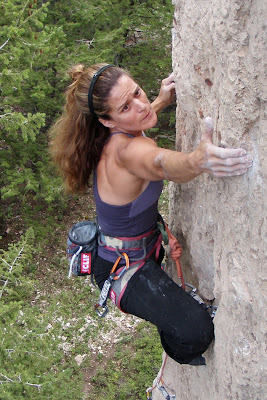 What are some tips you can offer to women who might think their age could prevent them from climbing? (Author's note: Alli's first 5.14a redpoint came after she turned 35.) You can start/get better at climbing at any age and you can excel at it at any age. I have seen people almost twice my age crush routes harder than I can climb. It's more about training properly, eating properly, resting properly, and understanding that developing technique, strength and power takes time and effort. The key is to never lose faith and also to only compete against yourself instead of comparing yourself to others. Though it might be a bit cliché, why do you climb? Nothing else makes me feel more complete as a human being. It pulls together my mental, physical, and emotional being into a complete, in-the-moment experience. The challenges are never-ending and no two climbs are ever the same, so it's never boring or repetitive. Climbing offers endless diversity and potential for self improvement in all areas of personal development (emotional/mental/physical control, strength, endurance, discipline, tolerance for failure, etc.). You can take what you learn in the climbing arena and apply it to other life experiences, too. What is the biggest climbing training mistake people make? Not focusing on training weaknesses and climbing to and training their strengths. Get an independent party (or several), like your climbing partners or a personal coach to evaluate your climbing and be prepared to accept what they say, especially if you get a consensus feedback. Create a climbing training regimen that directly addresses your weaknesses and stick with it, understanding that it may take months or even years to improve those weaknesses, depending on how long you've let them flourish while climbing to your strengths. What are some of your favorite tips to help climbers with goal setting? Start with setting your dream goals--those long-term goals representing your ultimate climbing (or life) dreams. Then, build in medium-term goals that are realistic to accomplish in the next year or two. Finally, set some short-term goals for yourself on a daily, weekly and monthly basis to help guide you toward those medium-term goals and keep you focused and directed. It's okay to change them, too, as needed. Goals should be used to motivate and inspire, only in a positive way. What's next for you? Any exciting projects you're working on? thanks, glad you enjoyed it! Alli's a pretty inspiring lady. she does, doesn't she? thank you so much for reading it! This quote hit home (well, a lot of them did, but this one in particular as I continually strive to come into my own as a climber): "I love sport climbing more than any other climbing discipline because I love climbing solely for the movement (not exposure or danger--I'm a chicken)." Thank you Alli for taking the time to talk to Katie (one of my favorite people) and thank you Katie for such a wonderful, inspiring and motivation interview.